The glowing or emission of light that shows up on a surface of tissue that has been exposed to X-rays: The roentgenoluminescence which was visible to Dr. Anderson was the result of the bones in Jeff's foot which were being exposed to radiation. A condition of being reddish, or a process of blushing: "The rubescence that spread across the sky at sunset was spectacular." "When Mark stumbled and fell down, he had a rubescence on his face because he was so embarrassed." 1. Scintillating feebly: "My mother walked home in the scintillescent starlight while the darkness pressed in on her from the countryside." To grow older; to reach maturity: The dog was senescing and was not as active as he used to be. Even though the trees in the forest had senesced they were in fact still healthy and green. 1. The physical period of being elderly: There are researchers, physicians, and others who believe that people are born, grow rapidly to maturity, and then coast along on a more or less comfortable plateau until they begin the period of senescence. In human life, senescence is equated with the period of functional-bodily decline that precedes death, with the appearance of age-related diseases. 2. The normal process or condition of aging, as distinguished from the effects of disease in advanced years: The gerontologist, Dr. McMahon, met with Mrs. Nelson to discuss the senescence that she was experiencing, now that she was well over 95 years old. 3. 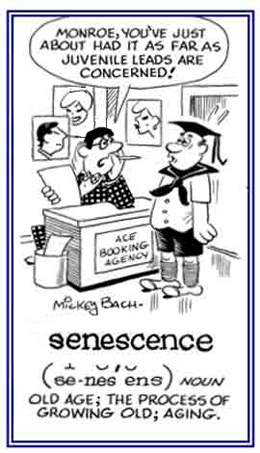 Etymology: from Latin senescere, “to grow old” from senex, "old." © ALL rights are reserved. It would be impossible to isolate a single thought or feeling, a single belief or assumption, that doesn't have some effect on aging, either directly or indirectly. Because the mind influences every cell in the body, human aging is fluid and changeable; it can speed up, slow down, stop for a time, and even reverse itself. —By Deepak Chopra, M.D. ; Harmony Books; New York; 1993. Approaching an advanced age: Mark's white hair was a senescent sign that he was past his prime. "Seven Ages of Man" or "All the World's a Stage"
William Shakespeare from "As You Like It"
Mewling (whimpering, sobbing) and puking in the nurse's arms. Sans* teeth, sans eyes, sans taste, sans every thing. A preference or a strong desire to sleep. In physics, a brilliance that is produced in certain materials by high-frequency sound waves or phonons: The physics students in Mr. Greg's class watched the creation of sonoluminescence in a test tube, watching the bubbles, created by sound waves, pop and emit bright flashes. A reference to the emission of short bursts of lucency from imploding bubbles in a liquid when excited by sound: Various sonoluminescent sparkling lights may occur whenever sound waves of sufficient intensities create gaseous cavities within a liquid to quickly collapse. The sonoluminescent bubbles in the thick liquid in the test tube appeared like bright and instant glowing brilliances that quickly disappeared. Tapering; tending to become spiny. Glowing factors resulting from exposure to high temperatures: The stones from the cave produced a green thermoluminescence as a reaction to the heat that was applied to them. Descriptive of the production of incandescence by a substance when its temperature is increased: Thermoluminescent reactions take place when certain substances have been exposed to the action of X-rays. By measuring the amount of thermoluminescent gleaming that is given off, the duration of exposure to radiation can be determined; so, it has been used to determine the age of various minerals and archaeological artifacts.